It was a funny week last week. Rain rain and more rain seemed to be the order of things. Nigel and I had arranged to try for bass and mullet one evening and the heavens opened. We chickened out only to find that Rob and his dad had gone down in the rain and had an excellent session catching both bass and mullet. Well, that's fishing but the following evening saw us down there and rarin to go. Although the conditions seemed more or less identical to the previous evening the fishing was rubbish. Apart from a couple of tiny schoolies on my Redgill we had nothing. 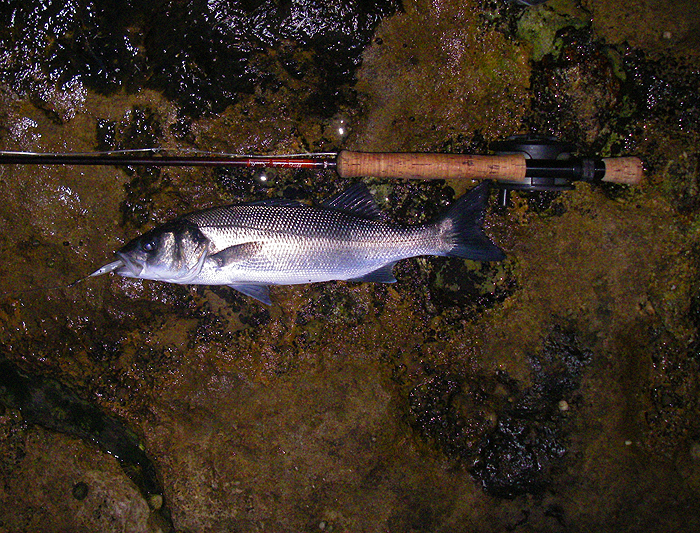 Anyway, a couple of days later I decided to try an early morning session with the fly rod. 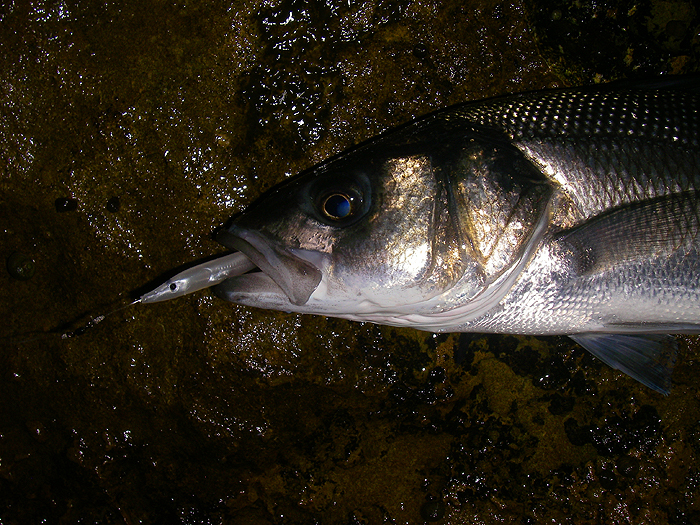 As it happened I'd bought myself a couple of unweighted, 4" silvery-white Redgills to try on the fly rod. They were bigger than my usual 'flies' and the first thing I did was change the fine wire hooks for heavier gauge stainless versions. They were a bit short in the shank so I had to add a short nylon link and a swivel to tie them on. Anyway, the next morning my trusty alarm failed me and when I woke up and looked at the clock it was already 03:30 - half-an-hour late! I leapt out of bed, dressed and grabbed the gear. It was a pleasant morning and the smell of the honeysuckle as I hurried down the cliff path was fantastic. Anyway, I scrambled down to the rocks and began to fish. It was perhaps ten minutes before I had a bite from a small pollack. In the next fifteen minutes I missed probably a dozen bites. Much worse than usual. Probably my new hook wasn't quite what was needed. 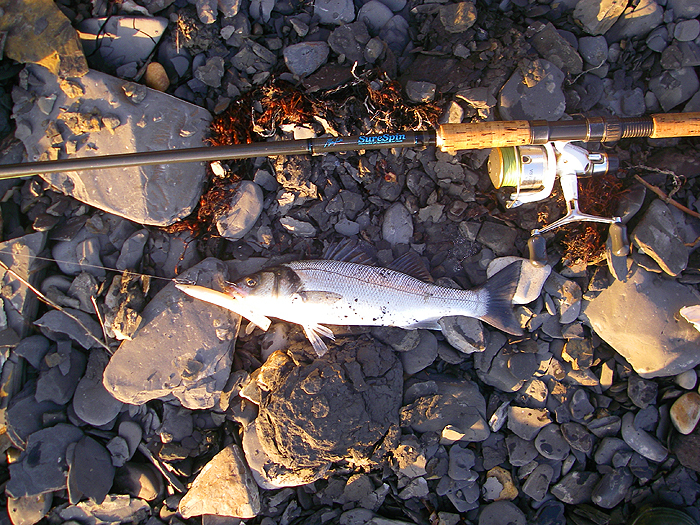 I had a few casts with the spinning rod and an 18cm Evo Redgill. Nothing! Back to the fly rod and more missed pollack. I was just beginning to feel a bit despondent when I had a good pull and found myself attached to a decent fish. After a few runs on the well bent fly rod and some splashing about I landed a reasonable bass of perhaps 2.5lb. Excellent! I immediately switched back to the spinning gear and on about my third cast I hit a better bass of roughly four pounds but after a couple of thrashes it came off. By now the sun was coming up and the fish had gone. One bass landed, another one lost and a load of missed pollack in less than an hour. Well I suppose it could have been worse (it often is).